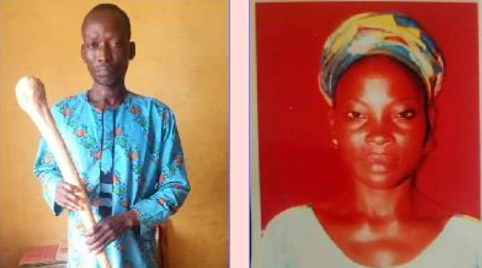 Operatives of Ogun State Police Command have arrested a 47-year-old man, Kazeem Adebayo who allegedly killed his lover and buried her body inside his room in a bid to steal her aged mother’s N530,000. According to the police, Adebayo allegedly committed the offence at his Ijebu Igbo residence, on January 24. Adebayo was said to have invited his lover, Abosede Adesanya, 30, a mother of five children, whose 84-year-old mother, Amoke, recently sold their land to buy another landed property where they could build a two-bedroom flat for themselves. Police spokesman, Abimbola Oyeyemi, in a statement said Adebayo was one of the signatories to the sale of the land and had told the old woman he would assist them in getting a good land where she and her daughter can build their home. Unknown to the women, Adebayo allegedly had a plan to fleece them of the money which he actualised by phoning the deceased to come to his place with the money that he had seen a good land for them. Oyeyemi said: “She told her mother and left the house with the money to her lover’s place. When she got there, he hit her on the head with a stick, killed her, buried her in a shallow grave inside his room and took the money from her. “He was owing someone N30,000 and so, he went and paid off the debt, then kept the rest of the money in his ceiling. “When night fell and the old woman did not see her daughter, she called her phone but it didn’t go through. She called the suspect and he denied ever calling her. He claimed he has not seen her and so, the woman reported at the Ijebu Igbo Police Station the following day being January 25. “Policemen were sent to the suspect’s house. He denied seeing the lady. The case was transferred to the State Criminal Investigation and Intelligence Department (SCIID) and findings led detectives back to the suspect in whose room, a shallow grave was uncovered which was dug and the deceased was seen inside. “It was at this point that the suspect confessed to killing the deceased and that he took possession of the N530,000 on her. He confessed further that he used a club to hit her on the head which led to her death and subsequently buried her in his house so that no one will know. “He also confessed that he used N30,000 out of the money he took from the deceased to settle an outstanding debt while the remaining N500,000, which was in his ceiling, he told a friend of his to take it out to avoid any search that would implicate him. “We are currently on the trail of that friend and will get him soon. The corpse of the deceased has been deposited in the mortuary. The suspect would be prosecuted at the conclusion of investigation,” Oyeyemi added.